I am extremely passionate and dedicated to ensuring that my patients receive the best treatment available for all of their musculoskeletal needs. Dr. Palumbo is board certified by the American Board of Orthopaedic Surgery and fellowship trained in adult reconstructive surgery. With a focus on diagnosing and treating hip and knee arthritis and its affects, Dr. Palumbo treats patients with a spectrum of conditions including extremity fractures and general musculoskeletal issues. His specific clinical interests include painful and/or infected hip and knee replacements, primary hip arthroplasty through an anterior approach and unicompartmental knee arthroplasty. 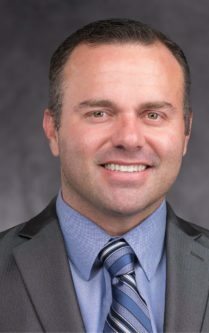 Prior to joining Florida Orthopaedic Institute, Dr. Palumbo served as the chief administrative resident at the University of South Florida’s Orthopaedic Residency Program and has also served in the Special Operations Command of the United States Air Force. He currently serves as the Medical Director at Florida Hospital Tampa Orthopedic Care Center. Dr. Palumbo has authored more than 10 articles, reviews, and research studies and has delivered more than 10 lectures for professional organizations such as the American Academy of Orthopaedic Surgeons, Southern Orthopaedic Society and Florida Orthopaedic Society. He was awarded, from the Journal of Orthopaedic Trauma, Best Orthopaedic Trauma Training Resident in 2009, and currently serves as a member of the American Association of Hip and Knee Surgeons and the American Academy of Orthopaedic Surgeons. Dr. Palumbo’s personal interests include clinical and basic science research, personal fitness and, most of all, spending time with his family. Avid runner my entire adult life. Completed seven marathons, but in the last few years have been experiencing increasing pain in my right knee. Finally went to a doctor, got some x-rays and was referred to Dr. Palumbo. He and his outstanding staff quickly diagnosed a need for a right hip replacement. Dr. Palumbo performed the surgery about a month ago. The entire experience was outstanding. Back to working out every day and my right leg is already in way better shape than it was prior to the surgery. Dr. Palumbo operated on my bone on bone knee in January. The knee replacement healed quickly and relatively pain free. I have my other knee on the calendar for surgery in May and can not wait to dance again pain free!! He and his staff are the best! After suffering for more than 20 years, I finally got a full knee replacement. Dr. Palumbo and his staff were wonderful. Appointment times, cost, explaining all. Never did I expect to have such a great result. Best thing for me and my family. I can walk comfortably again. I would recommend this doctor and his office wholeheartedly. Dr. Palumbo changed my life! After being turned down by other orthopedic surgeons for hip replacement surgery due to my age, only Dr. Palumbo approved me. He is very knowledgeable and very understanding. He only wants what is best for his patients and after having surgery, I feel like a whole new person. I am forever grateful to him for having helped me through my pre and post operative surgery. Thank you so much, Dr. Palumbo! Dr. Palumbo performed a right lateral partial knee replacement on me in December. Now, I am pain-free and walking and riding my bicycle again without difficulty. The final hurdle is to get back on the ice and rejoin my hockey team. Dr. Palumbo is a wonderful surgeon and a very understanding doctor. He is not in a hurry and he listens to all your complaints, answering all your questions. I will recommend him to everyone. Dr. Palumbo and his staff are the best! Truly awesome people to deal with and a great experience! I highly recommend them. Thank you for everything. Two months ago, I had knee replacement surgery. I am so happy with my results. I was pleased with how quickly I was able to walk. My knee bend is 130 degrees after physical therapy. Dr. Palumbo and his PA are the best. They improved my life greatly. I highly recommend them! I really enjoy Dr. Palumbo. He is very efficient and this is the second hip replacement that he has done for me. He is very friendly and I have total confidence in him. I just made arrangements for my remaining knee replacement during my 6-week conference following the replacement of my left knee. I am totally pleased with the facility, physicians, assistants, nurses, office staff and X-ray staff. 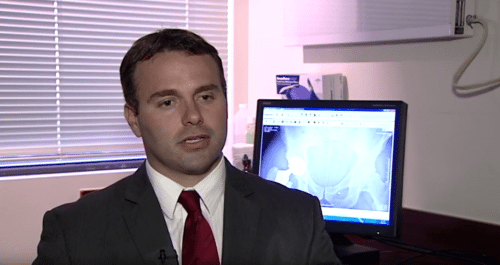 I spoke to Dr. Palumbo about my hip pain. He did a right hip replacement. I was walking two hours after surgery. No pain, no limp! Remarkable! After one week, I was walking on my own. No walker or cane. God blessed this man with a remarkable gift! Dr. Palumbo gave me a great new knee. I was playing golf in four weeks. I would recommend him to anyone needed a knee. I’ve been seeing Dr. Palumbo for knee injections for a few years now. He’s an excellent doctor who gives great advice and listens to his patients’ thoughts and concerns. If I eventually need knee surgery, he’ll be my doctor for that too. Highly recommended. I had a total knee replacement six weeks ago and am doing wonderful. My chronic pain is gone while only healing pain remains. I am getting better every day. Dr. Palumbo is a great surgeon using up-to-date methods and he truly cares about each patient. I had a partial knee replacement and Dr. Palumbo did an excellent job. I’m into week 5 of recovery and doing great. No pain. Thank you. I highly recommend him. The whole staff is just great at what they do. I had a total knee replacement on April 30th. Dr. Palumbo performed the surgery and did an outstanding job. He is very caring, professional and knowledgeable. It has been approximately 3 months post surgery and I am doing great. Also, his office staff and Florida Hospital staff and nurses are very professional and helpful. I highly recommend him. Thank you, Dr. Palumbo. Seven weeks after my hip replacement and I feel like a new person. Just climbed up two flights of stairs the other day like I was a kid again. Couldn’t walk up an incline before the operation. Thanks, Dr. Palumbo! I am grateful to my friend for recommending you to me. Great Doctor! Dr. Palumbo explains all options that are available for your condition and respects your decisions. Dr. Palumbo is one of the finest doctors I have ever met and had the pleasure of having him care for me. I went to see him for a bad right hip and the first thing he did after reviewing my x-ray was offer alternative treatment. We proceeded with physical therapy and injections, both of which were helpful. When I did have surgery, he explained the complete procedure to me and answered all of my questions. He made sure that I understood everything. The surgery was easy and I was back to 90% in three months. Thank you, Dr. Palumbo. Dr. Palumbo and his staff; Brian Hensley, PA-C, and Aisha Oleabhiele, Administrative Assistant, were among the finest medical professionals that have ever treated me. Dr. Palumbo is not only an excellent surgeon, he is caring, personable and absolutely committed to making you better. My total knee replacement surgery and recovery has been very successful. The care and guidance I received from Dr. Palumbo was incredible and this staff deserves all the credit. All I can say is thank you so very much for pain-free walking. Dr. Palumbo responded to my questions and concerns in a great way. I had a very bad experience with a different doctor at a different facility, but I am totally satisfied with Dr. Palumbo and his staff. I would recommend him, his staff and Florida Orthopaedic Institute 100%. Great doctor, kind caring and professional, and a wonderful assistant! My surgery went well and my new hip is terrific. Dr. Brian Palumbo was understanding of my wants and needs for my hip surgery from the first consultation. He took into consideration all other health issues I had and we discussed a plan of surgery, Rehabilitation, and recovery. Let me say that, Florida Hospital Tampa, Advanced Wellness Rehab and Achieve Home Health, had nothing but great respect and praise for his abilities and success rates. They have strict guidelines they must follow for hip and knee replacements through his office. Two weeks out from a hip replacement surgery and Dr. Palumbo is telling me to slow down. Highly recommended! When I was looking for a facility for my hip replacement surgeries, I knew from my experience as a registered nurse that Florida Orthopaedic Institute was my best option. When selecting a doctor, I just wanted someone caring and compassionate; I found that in Dr. Palumbo. He was wonderful! Very caring, understanding and personable, and was exactly what I needed. Before finding Dr. Palumbo, I battled breast cancer and dealt with months of hip pain. When I went in for my first appointment, I made my goal clear: to be able to walk around the new Wesley Chapel Mall. I was there on opening day. A few factors made my experiences at Florida Orthopaedic Institute truly exceptional. I was able to speak with Dr. Palumbo’s assistant, Aisha, whenever I needed and she always got right back to me when I would call. She is the best. Additionally, Dr. Palumbo was able to release me from the hospital just a day after my surgery, lessening my risk of infection. Florida Orthopaedic Institute and Dr. Palumbo gave me my life back. Dr. Palumbo went so far beyond my expectations it’s hard to put into words. I went from barely being able to walk for more than 5 minutes, to feeling like an 18 year old kid again in a matter of two short weeks. Under Dr. Palumbo’s leadership, the entire team at Florida Orthopaedic and Florida Hospital Wesley Chapel put patient care above everything else. Only one word could explain all of this….LOVE!